Raphaella Smits, once a Steiner student herself, is happy to support this initiative for an extra Waldorf school in Antwerp. 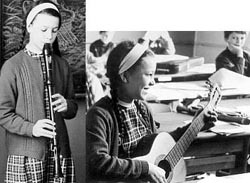 On April 11, 2008 at 8 p.m., Raphaella will play in the Roma Auditorium a benefit concert in aid of De Kleine Wereldburger, (the little world citizen) a new Waldorf school in Borgerhout (Antwerp, Belgium). Early 2007, at the enrollment for the school year 2007-2008, the 'demand' largely exceeded the 'supply'. Some parents, grandparents and teachers then have taken the initiative to set up a new kindergarten, based on Waldorf education in Borgerhout. It turned out to be a big adventure to put such a dream into reality in next to no time. Yet this close-knit group of enthusiasts did it: they found a suitable building, well located and (provided a thorough facelift) with a great atmosphere. They worked like mad and achieved to open up the first kindergarden class in the new school on september 2007. The established Antwerp Waldorf school supports the project and a lot of sponsors and sympathizers do help with financial aid or with volunteer work. The intention is to grow from this class for toddlers between 2,5 – 6 years old to a complete primary school, well embeded in the cosmopolitan neighbourhood and adjusted to the needs and the challenges of today's cultural mix. The initiators want to provide the best education for kids from all sections of the population, corresponding the wish of the founder of this pedagogy: Rudolf Steiner. (grand) parents at work in "De Kleine Wereldburger"